When are bees most likely to sting? Do bees die after they sting you? Today’s Wonder of the Day was inspired by jaylen. jaylen Wonders, “How come bee stings hurt?” Thanks for WONDERing with us, jaylen! Wonder Friends probably already know how important bees are to the process of pollination. Thanks to bees, our plants and flowers grow and reproduce from year to year. However, bees are best observed from a distance. If you've ever scared a bee, gotten too close or stepped on one, you know it can be a painful experience. Bee stings can hurt a lot and turn an otherwise nice summer day into a day you won't soon forget for all the wrong reasons! When most people think of bee stings, they're thinking of stings from the honey bee. Honey bees that are out and about searching for nectar or pollen away from the hive usually won't sting anyone. Honey bees at home protecting their hive, however, are another matter entirely. Honey bees vigorously defend their hives from perceived threats. If you stumble upon a honey bee hive and the bees sense you as a threat, they will actively attack and try to sting you. When honey bees sting, pheromones are released that can incite other nearby bees to join the attack. One stinging bee can turn into hundreds or even thousands of stinging bees in just a short time. In a hive, the female worker bees are the bees that sting. The larger male drone bees don't have stingers. Queen bees also have stingers, but they rarely leave the hive to use them. When a bee stings you, its sharp, barbed stinger pierces the skin to inject venom called apitoxin. In most cases, the stinger's barbed end gets stuck in the victim's skin and tears loose from the bee's abdomen. Not only does the stinging bee leave behind its stinger, but it also leaves behind part of its abdomen, digestive tract, muscles and nerves. This massive injury is what kills the bee. The part of the stinger left in the skin can continue to pump venom into the victim for up to 10 minutes or until it is removed. Honey bees are the only bee species that dies after stinging. However, honey bees can sometimes survive after stinging if the victim's skin is thin and doesn't hold the barbed end of the stinger. 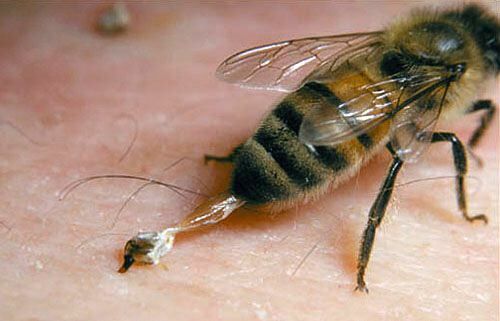 This doesn't happen all that often, though, because honey bee stingers are designed to stick in the skin of the victim to maximize the amount of venom injected into the victim. Bee stings can be quite painful. For some people, though, they can actually be deadly. Some people are allergic to the venom in bee stings. For these people, a sting can trigger an allergic reaction that causes a dangerous — and sometimes deadly — condition called anaphylactic shock. We hope you can sit and stay for tomorrow's Wonder of the Day! Can a bee sting taste good? It can if it's in the form of Bienenstich, also known as Bee Sting Cake. It's a German delicacy that features a creamy filling with a sticky, sweet honey almond coating. It might get its name from the honey topping. Others believe its name came from the fact that its inventor got stung by a bee the first time he made it. Still others believe a German village was saved from invaders when its residents threw bee hives at attackers. They supposedly celebrated by cooking this cake. Whatever the true story is, it's delicious. Head to the kitchen and bake your own Bee Sting Cake today! Bees are important to humans as they pollinate various crops. Check out this TED Talk about the first 21 days of a bee's life, and hear what's being done to help the bees. Get the stinger out! Removing the stinger as quickly as possible will help reduce the amount of venom that gets into the body. Wash the area with soap and water and apply an ice pack to reduce swelling. If you're in pain, ask your parents or a doctor for over-the-counter pain medication. An antihistamine can also help with itching and swelling. Seek medical help from a doctor or a hospital if you get stung near the mouth or the eyes. Also seek professional help if you notice trouble breathing, unusual swelling or dizziness. Yikes! That must've hurt, Cameron! Wonderopolis launched on October 4, 2010--so we're going to turn 9 this year! Wonderopolis, I’m a huge FAN!! We're so glad you're one of our Wonder Friends, Cameron! Thanks for your eagle eyes, waluigi! We've fixed it! Bees sting because they want to protect their babies and hives. Protection is definitely one of the reasons bees sting, Nelly! but why do they sting us, do we look good to them? The fourth paragraph says, "Honey bees vigorously defend their hives from perceived threats. If you stumble upon a honey bee hive and the bees sense you as a threat, they will actively attack and try to sting you." So, stinging is a bee's form of self-defense. You're lucky, sloth! It does hurt a lot--and the pain level usually depends on the type of bee. We're not sure, Maddie--but that's a great question. Maybe you can head out on a little Wonder Journey and let us know what you find out! We hope that you learned lots of new information to include in your essay, Wonder Friend! Thanks for WONDERing with us! Do you have a specific question about this Wonder, Zeriah? We're glad that you're WONDERing with us! Hi, 1026267610! We hope that you read through this Wonder to find out more about why bees sting! Hi, sabrina! We haven't tried it. Do you know anyone who had tried this? How did it work for them? The bees just get scared! Thanks for sharing your thoughts, Roshani! We were WONDERing the very same thing! We hope you find out after you read the article! (Oh man, our boss is on here!) Hey, boss! You must be pretty pleased with all this great WONDERing going on, huh? Oh no, Christina! We hope your grandparents are doing alright now. We're glad you found Wonderopolis! Your article is on honeybees, yet you show a yellow-jacket (wasp) in the illustration. Can you update your image to represent 'apis mellifera' (the honeybee)? Honeybees also only sting as a last resort, as they will die if they do. Honeybees generally have no interest in humans... only nectar and pollen from flowers. You said honeybee dies what about the yellow jackets, do they die or just keep multiplying? We're sorry to hear that, Hello. We hope it didn't hurt too badly! what kind of bee dont sting you? i have been wondering this for a long time. If you're allergic to a bee and it stings you, what would happen and what are those! Wonderopolis, How do male bees protect the hive, if they do not have stingers? I'm doing a reasearch project on honey bees, and I was wondering if you could tell me a little about queen bees. Do you know anything about them? It does not really have anything to do with bees, but it is still BAD. One time when I was 3, it was summertime, and I was playing outside. My mom was working in the garden, and she asked me to get her the hose. The hose was on the other side of the porch, and I quietly looked around the corner because I thought I had saw a few wasps. I told my mom, and she said to get it and not to bother them. I started to cry, but did not want to get in trouble. I decided to run for it, but literally got stung in my eyelid. I started to cry again, and after a couple days, I told my mom that I told her so. Do you think wasps hurt worse than Honey Bees? Thanks for listening to my mind WONDERing! wow. ;( That must've hurt. I bet it hurt and I'm glad that everything went well. when i was 9 years old (2014) i went to clyde (OTAGO, NEW ZEALAND) for a holiday and i went behind a caravan as i started to pick a bulb and on the flower above it there was a sleeping bee and i must have woken it up because it stung me and i screamed at the top of my lungs ahhh. Not all bees sting when your near by because once I was near by a big fat black bee and supriseingly it did not sting me at all and when I saw it again I got scared and tried to shoo it away (this is when I was 4 and did not know better) and it did not sting me still and then I disited to take a picture and see how it reacted and it was not stinging me. By the way can you tell me what the name of the bee was because I looked on Internet 3 years later and it did not tell me so I'm just wondering what it's name was and that for some reasone some bees do not sting people. Hope you have a great day! Maybe it was a male bee then................So confusing it looked like it had a stinger though! I always would comment on WONDEROPOLIS I love this website. ? and I would always comment back to you!? I never knew some of this information how the do you guys know something about this passage and video. Do boy honey bees sting? why do bees die when they sting? Which bee has the strongest sting? I got stung by a bee in my face and didn't do any of the thing you are talking about so now what do i do. Did you know a tornado picked up a sleeping baby set it down 320 feet away and the baby was alive ... And still asleep! Ouch, Donavin! That must have hurt! If you were stung recently, the tips in the "Try it Out" section may help you to feel better. does the queen bee die after stinging to or can it sting more than once before dying? so the bee dies right after it stings? I didn't know that some bees can kill you. Lets hope I don't get stung. Are there any good books written for children that tell more facts about bees? I have had two sets of bee stings two weekends in a row, and that got me thinking - is it possible the bees pheromones were still on me and that is why I got stung the second time? It seemed a bit random that I wouldn't have been stung for about 15 years and then get stung two weekends in a row. What's the difference between a wasp and a bee? Also why don't wasps make honey and what do they eat? Dear Wonderopolis, Wow that was awesome. I learned that queen bees have stingers and males don't have stingers. I never knew males didn't have stingers. Yes bee stings are painful, they hurt so much. Pheromones are interesting, if I ever get stung by a bee I'm never going to go back outside. What type of bees are here? I abhor bees! Did you know that the planet Pluto was named from an 11 year-old girl? Hi Wonderopolis! I liked the video about the bees but how come the bee dies when it stings you and the wasp doesn't? I got stung on the finger once and it felt like someone was pinching me and never letting go!!! It hurt!!!!! I will never go by a bee hive again because I might be allergic to the venom in a bee sting. So whenever I see a bee or a bee hive I will run away!!!!! How cool! :) Thank you! The black and yellow part of the bee is furry. Why is that? Well I was at summer camp and this girl came and intentionally steped on a yellow jacket hole and I was turned around talking to a teacher when all of a sudden everyone was screaming and I could not figure out why, then I saw 3-4 yellow jackets stinging me then soon there were 12 of them. When all of us were inside we were crying super hard while she was over their laughing like crazy. From that day I learned who my friends are and who are not! It was the end of the day so there was only 10 of us left and 4 of us got stung. Just because of that incident 2 teachers had to risk getting stung and that's how it all happened. Very neat I never knew that! Do they sting because of plants too? Trust me. I hate bees a lot. I got stung twice. One on my foot and one on my forehead. The foot one, the bee was already dead and its stinger was still in him. The forehead one, I saw one in in 5th grade and I was scared because it was following me. Without thinking, I trapped in on my forehead. Thankfully they weren't honey bees because their stingers weren't stuck in me and I didn't have any real after pains. If you run after a tornado will it turn around or keep on going to that direction? I have never been stung before but my sister has, twice. Why don't drone bees sting? How long do bees live? Why do bees stings hurt so bad? Why do bees have so many babies at one time? How do you know so much about bees? Nice wonder you should do a wonder on famous left handed people. (P.S. I'm left handed) Please do the wonder. Thank you. Now I know what to do if I get stung by a bee. Do you guys have a bee hive near your house? I do. I know the answer to the wonder. Bees sting you whenever you bother them sometimes they sting you when you get too close. I'm sure you guys get a lot of these questions, but why do bees die once they sting you? Sorry I didn't comment when I usually do but I am now! I knew a lot about bees so I knew almost all of that. All I really don't know about bees is the types. I have been stung many times, only once this past summer though. They HURT!!!!! I think tomorrow's wonder will be about a very famous race. Thanks for the info about bees it really helped. Do yellow jackets sting? I have a question. Can you dissect a bee? I know bee stings are painful but didn't know that they can be deadly. Can a type of bee kill you??? Can a another bee kill another bee??? I learned that the female bees are have stingers and they are the worker bees. If you're stung then you can put tobacco on it and it will make it take away the sting. Dear Wonderopolis, I learned that bees aren't as scary as we all thought. Bees actually help us. Why do bees die on their own? If you get stung by a thousand bees at once will you get badly hurt or possibly get sent to the hospital? Thank You! Those are cool facts about bees. I learned that honey bees die after they sting people but my question is why do the queen bees don't do work? Why doesn't it protect the bee hive itself? Dear Wonderopolis, I learned that you have to scrape the bee sting out of your skin and put an ice pack on it. I have a question. Do you think bees sting other bees? Thank you! Alexa D.
Thanks to all our Wonder Friends for their awesome questions from today’s Wonder! Check out the WONDERing going on… Jon D: I would like to know if there is such a thing as a burrow bee? I would also like to know what the difference is between burrow bees and bumble bees? Also, how can I keep these bees away from my crab apple tree when I am cleaning up outside? Alex N: How do bees make the honey from nectar? Steve G: Does Wonderopolis like the band Big Time Rush? Michelle A: Do you guys know anything about bee hives and how bees sleep and eat? Elliot R: What do honey bees eat? Kevin B: My question for you is how are bees born? Alexa D: Do you think bees sting other bees? We are very excited that our friends are doing so much WONDERing on you own! We bet you can do some research to find out more about these awesome questions you posed. Jon D asked about burrow bees.We found some more information on burrow bees– they actually live, or burrow, in the ground instead of in a hive in a tree! Kevin B asked about baby bees. Queen bees lay eggs, usually in the hives, and that is how baby bees are born. Great work, Wonder Friends! Dear Wonderopolis, I learned that female bees have stingers. My sister got stung by a bee once. My mom helped my sister! My question for you is how are bees born? Sincerely, Kevin B.
Dear Wonderopolis, Thanks for teaching me about bee stings. I learned about how they sting. Thanks for teaching us about bees and how they stay in people's skin. I would like to say thanks for the video. I have one question for you. Do you guys know anything about bee hives and how bees sleep and eat? I am scared of bees! One of my family members got stung by a bee before! Sincerely, Michelle A.
Dear Wonderopolis, Today we learned all about bees. Bees are beautiful but can be mean. Bees lives in hives and try to find flowers. I learned that bees are good for planet earth! P.S. - Does Wonderopolis like the band Big Time Rush? Sincerely from, Steven G.
Dear Wonderopolis, Thank you for giving us the bee show. I learned that bees get nectar from flowers. How do bees make the honey from nectar? Thank you so much! I love Wonderopolis! Sincerely, Alex N.
Dear Wonderopolis, I liked reading about why bees sting. I am scared of bees, myself! I know how to protect myself from getting stung. I would like to know if there is such a thing as a borough bee? I would also like to know what the difference is between borough bees and bumble bees? Also, how can I keep these bees away from my crab apple tree when I am cleaning up outside? If I ever move these bees from my yard without using spray, will they come back? Sincerely, Jon D.
I think bees sting becase they are trying to defend themselves. We found out that bees die after they lose their stinger and start to fly. Also we learned if you start to vomit you should call 911. And also when you panic when you see a bee, it will try to sting you. Do some type of bees kill you? Do other bees kill other bees? Thanks for the info about bees. Did you know that the color purple means royalty in the mind? We learned a lot about bees. We watched the Wonder about pollination, we did not know that bees were so important in growing the food we eat. We think tomorrow's wonder will be about chasing a friend, airplanes, or cheetah. Once a bee stings you doesn't it die? In a hive, the bees that sting are which bees? bmale drone bees Not Quite! cmale worker bees Not Quite! dfemale drone bees Not Quite! What do bees release that incites other nearby bees to attack and sting? A bee sting can be deadly if someone is allergic and what condition occurs?